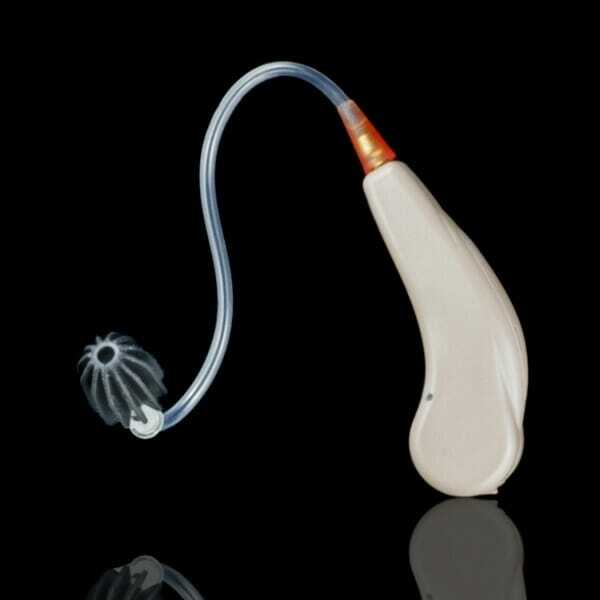 Starkey has replaced this with a newer model the Starkey 3 Series i70 . When hearing aids went digital, having been mostly analog (first simply acoustic and then analog electric since the 1920s), a revolution in hearing aids occurred. Suddenly – and improving each year since – manufacturers of hearing aids can now program aids to improve on those areas needed, not just make everything, including background noise, louder. Digital makes only those things you want to hear louder and clearer. Starkey has been on the leading edge of expanding digital technology. Their landmark nFusion processors cut a swath for many newer digital hearing aids and retains its place as a great breakthrough – and still a great hearing aid for those who need more than simply making everything louder. The Starkey Destiny 1200 OTE (Over-The-Ear) model allows the listener to hear sound far more naturally than with previous analog hearing aids. Feedback (squealing) is more easily controlled. Different settings can be programmed for different hearing environments, such as going from a loud restaurant to a quiet aperitif. And switching between programs can be done with the touch of a button (and even newer models can use remotes or change programs automatically based on your preferences). With digital technology you can pick what you want to hear the most – such as voices – and screen out what you do not want – such as large crowds.